Love cats and Rilakkuma? For the first time in Singapore, BonJapan brings Rilakkuma to a cat cafe. The Cat Cafe is humbled to be chosen by BonJapan to host this unique event. Who is the organizer for this event? 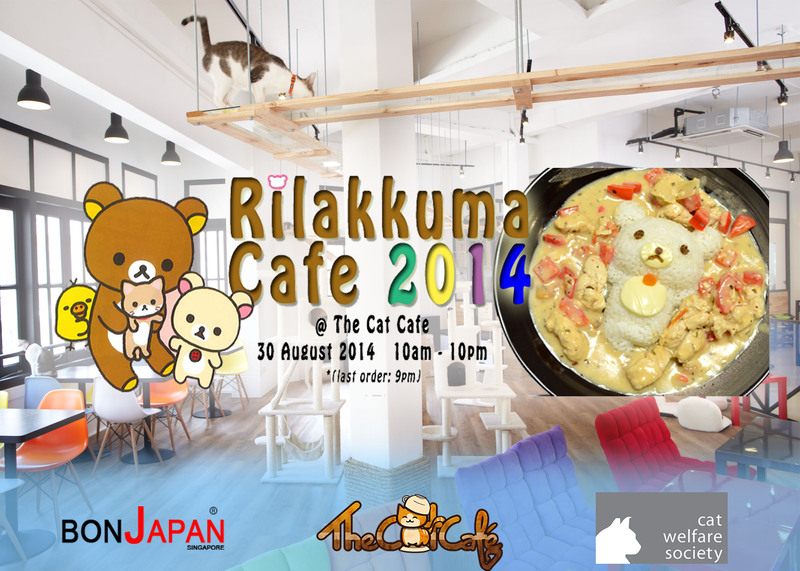 BonJapan is organiser of Rilakkuma Cafe 2014. BonJapan has held multiple character’s cafe over the past few years. Instead of the usual dishes that The Cat Cafe sells, BonJapan will bring in customized Rilakkuma dishes that are too cute to eat and so awesome for photos. Apart from food, expect tons of cuteness from Rilakkuma merchandise. Cats + Rilakkuma, the deadly combination of overloaded cuteness. How long can I stay at the cafe? Instead of the typical per entry charges, customer can only stay for 1 hour during for this event. Can I walk-in on the actual day? Yes you can, however we have limited seating capacity, hence we strongly encourage you to purchase the tickets from BonJapan. Does The Cat Cafe rules still applies? Yes, our usual cafe rules still applies. Cat Welfare Society is the adopted charity for this event and future Character Cafe held at The Cat Cafe. BonJapan and The Cat Cafe will contribute a portion of the day’s revenue to Cat Welfare Society. Why children are allowed at The Cat Cafe. What happens when 21 children meet 15 cats?